The Bible tells us that "it is easier for a camel to go through the eye of a needle, than for a rich man to enter the kingdom of God." Foreclosing on his pastor probably doesn't make the trick any easier. There's a new development in the housing crisis: Foreclosures are hitting houses of worship. 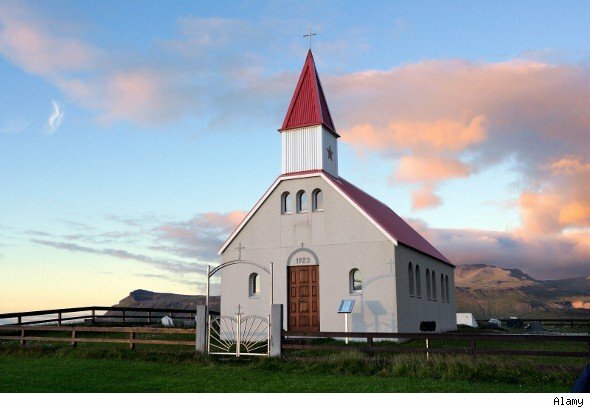 According to a report from Reuters, 2011 was a record year for foreclosures on church buildings. Prior to the Great Recession, bank seizures of houses of worship were rarer than atheists in foxholes, with only a handful of foreclosures occurring in the decade prior to 2008. That all changed when the mortgage crisis hit. Just as homeowners in the 1990s and early 2000s rushed to take advantage of rising house values and fatter wallets to spend lavishly on real estate, the real estate bubble encouraged irrational exuberance in the pews. Congregations took out loans to refurbish and enlarge their church buildings. Unfortunately, these loans were not the 30-year fixed mortgages that most of us are familiar with. Instead, churches took out commercial loans -- five-year loans with balloon payments at the end. The usual procedure was to refinance loans when their balloon payments came due. Problem is, loans predicated on the inflated real estate assessments that prevailed before 2007, once reassessed for possible refis in 2010 and 2011, were found to lack sufficient principal. Banks began turning down refinancing applications, and churches were told to either pay off their loans (i.e., make the balloon payment) or go into foreclosure. Result: From 2010 to present, bank foreclosures on church buildings have skyrocketed -- 270 foreclosures since 2010; a record 138 foreclosure sales in 2011 alone. Loan officers asked about this trend are, not surprisingly, chagrined. As one banker named in the Reuters piece complained: "It is not the practice of the Bank to [use] foreclosure in the absence of good cause. We trust the community will not rush to judgment without full knowledge of all the facts." Better pray for a miracle, then. It might make all the economic sense in the world to foreclose on a debtor that's unable to pay its bills. If a debtor can't pay, the logical thing to do is foreclose, resell the property, and try to get back at least part of the money lent. But when a bank does this to a church, it's playing with fire (and brimstone). Whatever fate may await foreclosing bankers in the afterlife, the perils in the here and now are clear. Foreclose on a family home, and you've made a handful of people angry. Foreclose on a church, though, and you've taken your PR nightmare wholesale. In one step, you've won your bank the ill will of hundreds of congregants -- or more. People who will, in all likelihood, spend the rest of their mortal lives regaling friends, neighbors, and other potential banking clients with the story of how they "will never bank with XYZ bank again -- those guys foreclosed on my church!" And it gets worse. Say a bank feels it has no choice but to foreclose on a church. What's it supposed to do with the property? Houses are no picnic to sell these days: Who's going to buy a house of worship out of foreclosure? Depending on square footage and nearby foot-traffic patterns, a slightly used church might make an appealing location for, say, a new Starbucks. McMansion shoppers might be another target demographic for the used church market, if the churches aren't too small. But as it turns out, Reuters reports that there is one bit of good news for the banks. Financial institutions foreclosing on delinquent church buildings have so far been able to resell most of their inventory to other congregations. Just as in the housing market, where foreclosures and falling prices created opportunities for new buyers to purchase starter homes, congregations that used to squeeze into a rented school gymnasiums or other temporary quarters are finding opportunities to buy starter churches on the cheap. As William Cowper once observed: "God moves in a mysterious way, his wonders to perform." Motley Fool contributor Rich Smith does not own shares of any companies named above. The Motley Fool owns shares of Starbucks. Motley Fool newsletter services have recommended buying shares of and writing covered calls on Starbucks. Strategic Default: Would Half of Homeowners Walk Away?